Get notifications from IRC hilights and private messages straight to your Android™ device! Project is open source, see GitHub project page for details. Check Google Play™ for screenshots. There are also unofficial support for WeeChat and Python. IrssiNotifier uses Irssi script to send IRC messages to server, and Google's Cloud to Device Messaging framework to send notifications to Android device. This minimizes the battery usage of your device, and enables notifications to be sent near real time. First download IrssiNotifier Android app from Google Play. After that, follow instructions about setting up the Irssi script in the help page. You'll need Irssi running on Linux server or similar (with wget installed). You'll also need an Android device (phone or tablet, or both) with Android version 2.2 (froyo) or later. All data is end-to-end encrypted with the encryption password of your choice. Password is never sent to the server. You'll have to login with your Google account, but no password or other sensitive data is collected. Check privacy page for details. This service was made by Lauri Härsilä, murgo @ IRCnet. If you have any questions, drop me a line by email or join #irssinotifier at IRCnet. Huge thanks to everybody who have donated money or contributed source! Thanks to Heidi Friman for icons. IrssiNotifier was created entirely on my free time. If you have found IrssiNotifier useful and want to help keep project alive, please consider buying the IrssiNotifier+ and/or donating through PayPal or Flattr. For latest developments, check project's Github page. New version of the app has been released, that fixes only single message showing up in the app. Thanks to everybody for reporting, and special thanks to jheidel for debugging the issue. 11.11.2018: Android 9 is now supported. New version of the IrssiNotifier app (1.9.1) has been released, which removes Google Cloud Messaging in favor of Firebase Cloud Messaging to properly support Android Pie. OpenSSL warnings are dismissed to get rid of AES-128 deprecation warnings of new OpenSSL. Probably not best practice. Feel free to fix properly and send PR. 5.7.2017 Irssi script version 22 released. New version of OpenSSL is now supported. If you're having encryption troubles, try updating the script. 21.2.2016 Server version 9 released. Messages should now wake up Android 6.0 correctly. Thanks, scolphoy, for the pull request. 8.4.2014 Irssi script 20 released. Run the last line each for every zombie process you might have. Check earlier news post for more details. Please contact me if you are having issues. 7.4.2014 Rollback of Irssi script 19. There's some issues with the latest release of the IrssiNotifier Irssi script, so it's been reverted until we get it fixed. Techinal jargon: broken script spawned a defunct zombie process for each highlight. If you have lots of Irssi zombie processes (ps x), run "/script exec wait;" in the Irssi. You have to run this one for each zombie process. 4.4.2014 Irssi script 19 released! Support for tmux! tmux attach/detach state is used through the /set irssinotifier_screen_detached_only. Thanks to mlb- and vanaltj for this. "Queue is full" error message should be fixed now, thanks qvr! Couple of miscellaneous bug fixes. 2.6.2013 IrssiNotifier/IrssiNotifier+ 1.7 with Irssi script 18 released! New script option: irssinotifier_clear_notifications_when_viewed. When this command is turned on, notifications on the phone are cleared automatically when you change away from the last window that had hilights. Pretty handy! Thanks to qvr for implementing this! App should no longer forget old messages when receiving new ones. Sorry about that, thanks for everybody who reported the bug. 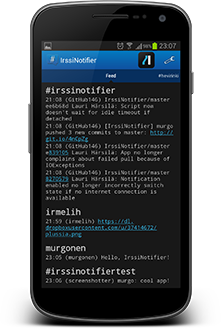 23.5.2013 IrssiNotifier 1.6 and IrssiNotifier+ released! Feed and channels now have date headers for increased readability, thanks qvr! Also, IrssiNotifier+ has been released. In addition to the above fixes, IrssiNotifier+ has the ability to pull the messages from the server on app startup, so you'll receive messages even if they don't get pushed through! This is useful when you are not online all the time, or if you have notifications disabled. You can support development of IrssiNotifier by buying it from Google Play. Thank you for your support. Irssi script now disregards idle timeout if you are not attached to your Screen, so you'll get notifications straight away after detaching. Also, the script should no longer send garbled notifications when using Twirssi or other 3rd party addon. Check the updated upgrade instructions. New server software is up! Lots of changes and bugfixes under the hood (improved perfomance, improved error handling etc.). Also, now you can remove devices from the profile page in addition to disabling them. As usual, if you run into some glitches or other oddities, please inform me through IRC or mail. I slightly botched up the version 14 release, so version 15 contains some hotfixes. No, this is not an April Fools joke, I am actually releasing something. Lots of fixes and new features for the script, thanks to many people who have sent pull requests to me! Just follow the two simple steps on top of help page to update. Added support for non-UTF-8 encodings. Thanks, qvr! Added built-in Screen integration. Thanks, qvr! Sending notifications should no longer freeze Irssi for a sec. Thanks, qvr! Added support for nick blacklisting. Thanks, turmoni! Added support for pattern blacklisting. Thanks, turmoni! Added support for pattern whitelisting. Thanks, turmoni! Added support for https-proxy. Thanks, rsdy! Yesterday's Google App Engine blackout caused some IrssiNotifier users to receive duplicate messages, Irssi freezes and/or other hassle. Sorry for that! Now, to prevent this from happening in the future, newest Irssi script now times out before freezing up. Updating is very much recommended. I accidentally deployed a broken work-in-progress version of the Irssi script yesterday, so if you installed or updated the script recently and are having problems, please update the script to the latest official version using these instructions. Fixed bug that caused app sometimes to freeze when clearing notifications. Hopefully actually got it this time! Fixed small bug with hard coded paths, if your Irssi complains about "cannot find wget" or OpenSSL, try updating the script. This is a major release. Older versions of Android app won't work any more, since server side has been changed a lot. Jelly Bean (Android 4.1) expandable notifications! 12.9.2012 New version of Irssi script: 11. Fixed bug where Irssi script sometimes caused other scripts like mail.pl to crash. New web page layout! Feedback is welcomed. Enjoy. 6.9.2012 New version of Irssi script: 9. Release also contain bugfixes like stripping broken color codes from notifications and various small other things. Check the help page for upgrade instructions. (To upgrade script, just follow steps 1 and 2). Script depends on wget and openssl. Optional: Change your encryption password with the following command. You'll have to change the password to the Android device, too. Password can be anything you like (forbidden characters: ", \, `). Do not use your Google account password (or any other existing password) for security reasons. Ask someone to hilight you or send yourself a private message and check profile page to see if it works. Download Android app from Google Play store. Run the app, select the Google account you want to use. Account must be the same as the one you signed to this website with. Go to settings and set your encryption password. Encryption password must be the same as the one you've set in Irssi script. When set to more than 0, you will not be notified from events that occur between going idle (i.e. not pressing any keys) and the set second count after that. When set to ON, notifications will only be sent if you are away. Useful in combination with screen_away script. If on, you don't get notifications when you are attached to the screen or tmux in which Irssi is running. When set to ON, notifications will NOT be sent from the Irssi window currently open. Be aware that if you forget window open while detaching your screen, you will not get notifications from that channel. When one or more channels are set, you will not be notified about hilights from those channels. You can also block query windows (private messages) with this command. Use space as a separator (e.g. /set irssinotifier_ignored_channels #channel query). When one or more servers are set, you will not be notified about hilights from those servers. Useful for blocking bitlbee etc. Use space as a separator (e.g. /set irssinotifier_ignored_servers IRCnet quakenet). When one or more nicks are set, you will not be notified about hilights from those nicks (users). Use space as a separator (e.g. /set irssinotifier_ignored_nicks mom murgo). Notifications about messages that contain the given regex-pattern are not sent. Uses perl regex. Use space as a separator (e.g. /set irssinotifier_ignored_highlight_patterns slap [lL][oO]+[lL]). Notifications about messages that doesn't contain the given regex-pattern are not sent. Only applies to public messages. Disabled if empty. Uses perl regex. Use space as a separator (e.g. /set irssinotifier_required_public_highlight_patterns slap [lL][oO]+[lL]). The given proxy is used for the notification sending. Pretty self-explanatory. If set to OFF, notifications from DCC chats are not sent. If set to ON, notifications on the phone are cleared automatically when you change away from the last window that had hilights. I'm not getting any notifications! Follow the installation instructions to the letter. Check the profile page to see if the installation works (or at least it has been working). Ensure the script is loaded in your Irssi. If you have restored the Android app from backup, clear its data. Notifications might also be blocked by firewall if you use wi-fi. If you need more support, please visit #irssinotifier @ IRCnet or contact me by mail at murgo@iki.fi. Notifications work only every now and then! Every device added to the system has certain limits for the amount of push notifications they can receive (about 20 per hour), which are reset gradually. Use above Irssi commands to reduce amount of wasteful messages sent to you. Furthermore, sometimes Android push notifications have unexpected delays, and some messages may even get lost. I'm getting decryption errors on my Android device! Check that the Android device has the same encryption password as the Irssi script. Instructions to set the Irssi script encryption key are above. On Android, just go to the settings menu. If you need more info, drop by #irssinotifier @ IRCnet or drop me a line at murgo@iki.fi. Please log in using your Google account. Messages are stored in the server for seven days. Messages are encrypted by user's own encryption password (be sure to change yours). User can wipe out his/her account from the profile page. This will remove all information regarding the user (including messages). Anonymous statistics (analytics) will be gathered from users visiting this web site. Anonymous and statistical usage is also collected from Android app users (how many users, from which countries are they from etc. ).